At one point in time, Nicolas Coppola, better known as Nicolas Cage (he changed his last name so as not to seem to be trying to cash in on his uncle, Francis Ford Coppola’s, name), was among the highest paid actors in the world, earning some $40 million in a year at the apex of his success. In 2009, Cage’s financial situation changed abruptly and he found himself in some rather dire financial straits. So what happened? The documented story of Cage’s financial turmoil began in 2001 when he hired one Samuel J. Levin to serve as his financial advisor. Cage would later blame Levin for sending him “down a path toward financial ruin”- a claim Levin vehemently denies, insisting that Cage did it to himself and that the actor was already in severe financial straights when Levin was hired. In fact, according to Levin, when Cage hired him in 2001, Cage already owed significant money to the IRS and had squandered most of his fortune up to that point on the usual trappings of the ultra-wealthy like cars, jewellery and artwork. Now, if Cage had just spent his money on cars and fancy houses, there wouldn’t be much of a story here since plenty of wealthy of people have lost everything buying stuff like that (humans gonna’ human)- not terribly interesting. But Cage’s path to financial troubles took a decidedly more eccentric route, more akin to legendary individuals such as Edward Hughes (The Golden Ball) and Evander Berry Wall (The King of the Dudes). You see, in addition to relatively normal excesses like Rolls Royce’s, a private jet, and a few yachts, Cage also bought some more, shall we say, unusual items. Unfortunately for Cage, in 2000 his LA mansion was robbed and this particular comic, along with a few other of the more valuable ones in his collection, was stolen. Cage was devastated by the theft and spent years searching for it, only for it to be found and recovered by the police thanks to one of the auctioneers on the reality TV show, Storage Wars– because nothing about Cage’s life can be dull apparently. Not content with owning some of the world’s rarest comic books, Cage also bought himself a veritable zoo’s worth of pets including a shark, a crocodile and a number of purebred dogs waited on paw and foot by hired handlers. Cage also owned a pet octopus he apparently bought for $150,000 and a pair of albino cobras called Moby and Sheba worth a cool quarter of a million dollars. According to Cage, he studied the octopus’s movements to improve his own acting… a claim that most speculate was just Cage saying that in an attempt to write off the octopus and associated expenses on his taxes. But if you pay close attention… maybe not? As for his pet cobras, Moby and Sheba, Cage claimed to need them for protection (again, perhaps so that he could attempt to write off their purchase for tax reasons). By far Cage’s costliest purchases though were the numerous properties he bought and then spent millions of dollars remodeling and having giant parties in. These include a dozen estates variously described as being “palatial” in nature (including two actual castles in Europe), two private islands in the Bahamas, and the famed LaLaurie mansion in New Orleans (see our article: The Twisted Tale of Delphine LaLaurie and Her House of Horrors). To be fair on these ones along with his many, many car purchases (including over 50 rare cars, such as a Lamborghini once owned by the Sha of Iran and a 1955 Jaguar D-Type he inexplicably decided to keep in his billiards room despite guests claiming that it was a complete mystery how he got the car in there), Cage had some success in the early going buying these, enjoying them for a time, and then re-selling them for significant profit. The profits stopped, however, when his acting career turned obscenely lucrative and he then mostly ceased doing the critical re-selling part, as well as started bidding for many such items at well over their projected market value to ensure he got them. Along with fancy furniture and creature comforts like giant toy robots (really), Cage bought countless impossibly awesome knickknacks for his many homes including dozens of skulls belonging to long-dead prehistoric creatures, as well as things like shrunken Pygmy heads. For a short period, the crowning jewel in Cage’s skull collection was a $300,000 T-Rex skull he supposedly outbid Leonardo DiCaprio for. 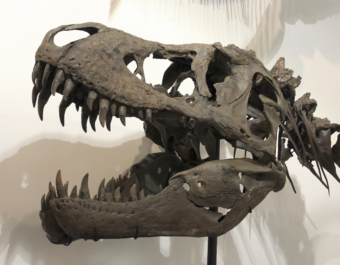 It would later emerge though that the skull had been stolen, prompting Cage to hand it over to authorities to be given back to the original owner. When he wasn’t walking around his house enjoying his collection of comic books and dinosaur skulls, Cage would throw massive “Gatsby-scale” parties at his various residences for his friends in Hollywood. Hugh Hefner would call Cage’s parties the “stuff of legend” and, remember, Hefner was a man who woke up every morning for five straight decades in a massive mansion full of scantily clad models. Although most of these parties invariably took place in Cage’s expansive Bel-Air mansion, the actor would frequently take his friends to his other residences at his own expense in his private jet. He didn’t go near broke all on excess, however. A lesser known thing Cage spent vast sums of money on during this period was donating money to charities as freely as he spent it. As a result, Cage has been ranked by Forbes as one of the most generous actors in the world. Not just helping out his favorite causes by promoting them in fund raisers, as so many celebrities do without making much in the way of donations themselves (which, to be fair, is still very helpful to said charities), Cage has quietly donated many millions of dollars to dozens of charities over the years. For instance, in 2005 he gave $1 million to the Red Cross and, in 2006, $2 million to Amnesty International. As noted, Cage initially blamed his financial adviser for this sequence of events, accusing him of keeping him in the dark about the state of his finances as well as skimming an excessive amount of money from Cage’s accounts (a claim Levin denied stating he was “paid a standard fee for a business manager”). Cage was so adamant about this that he even tried to sue Levin for several million dollars. Levin was furious about these accusations, filing a counter-suit against the actor and releasing a statement saying that he did “everything short of cutting up the actor’s credit cards” to stop him spending. Levin also claimed he wrote to Cage’s agent begging him to somehow stop Cage from buying more property, as well as also advising the actor to keep his spending within $30 million per year if he wanted to break even. He also claims he told Cage he really needed to pay his taxes promptly and for the correct amounts. Advice, it should be noted, many claim Cage just blatantly ignored, though in truth it seems more likely that Cage is probably being honest when he states he just assumed this was being handled for him correctly by those managing his finances. [Cage] knows that his losses are entirely and solely the result of his own compulsive, self-destructive spending, which he engaged in against Levin’s advice. In the end, both Cage’s suit and Levin’s counter-suit were dismissed by the courts in 2010. In an effort to settle his debts, Cage sold off virtually all of his assets including most of his cars, houses and dinosaur bones and reportedly began taking any movie role offered to him to earn some quick cash, explaining why he appeared in so many terrible movies in the early 2010s. Thanks to still being a top billed actor, however, Cage has seemingly weathered the storm just fine, today with an estimated net worth of around $25 million. This has allowed him to, in more recent times, start showing up at comic book conventions again where he occasionally buys rare comic books, though seemingly exhibiting a little more restraint this go-round in said purchases. How Big of a Comic Book Fan is Nicolas Cage? Nic Cage’s big-money problems: too many mansions, jets, cars and … dinosaur skulls? Yeah, your article is absolutely right: this is obscene !!! He also owns a Pyramid Grave yard in the center of New Orleans. The IRS did not confiscate that when he went broke. what happened to the video you did on this? We needed to take it down and rework a few sentences for legal reasons. 😉 It will be put back up probably sometime later this week. Please please please….do not edit Simon losing it out of the video. I appreciate the videos and Simons cool english delivery, but thats been my go to the last week when i need a pick me up, too funny. Thanks everybody that helps make Today, Biographics, Brainfood, etc possible. I hope to see this video again. It was awesome. Hey you can’t take it with you but you surely can be buried in it.